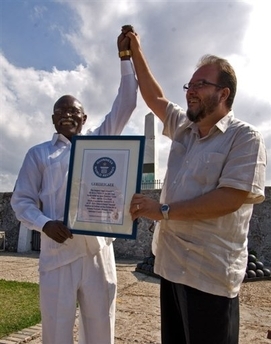 Havana – A Cuban cigar roller broke his forth world record, creating a 43.38-meter-long (142-foot-long) stogie that doubled his previous best. Sixty-five-year-old Jose Castelar smoked his own 2005 record of a 20.41-meter-long (67-foot-long) cigar, and vowed to continue to roll record-breaking creations. “I’m going to continue until I do one that is the length of the Malecon” he said, referring to Havana’s famous 10-kilometer (six-mile) seafront promenade. Castelar – who has rolled for a Saudi prince, among others – received a Guinness world record for his troubles. But the athletic-looking sexagenarian said he limits himself to smoking one cigar a day. This entry was posted on 2009-05-20 at 10:56 PM and is filed under Adult, Odd. You can follow any responses to this entry through the RSS 2.0 feed. You can leave a response, or trackback from your own site.